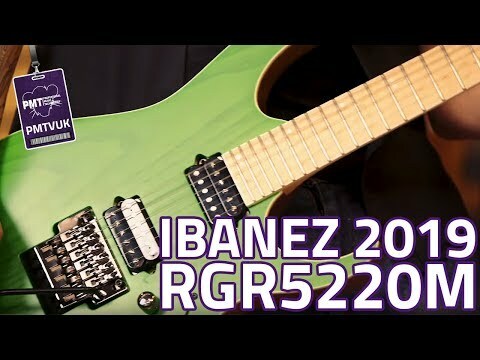 Develop your range, tone, and technique, with the high performance Ibanez RGR5220M Electric Guitar Transparent Fluorescent Green. .. Develop your range, tone, and technique, with the high performance Ibanez RGR5220M Electric Guitar Transparent Fluorescent Green. This brand new RG-style guitar from Ibanez is part of their amazing Prestige RG5000 lineup, and is ideal for the professional musician who is searching for something new to add to their experience. The brand new RG5000 lineup from Ibanez adds some welcome extras to the incredible Prestige range. In addition to the usual premium-quality construction, the RGR5220M-TFG comes complete with a whole host of new specifications aimed at the modern musician. In addition to the superior levels of craftsmanship gone into the creation of this guitar, you'll also find a set of Stainless Steel frets, a rigid 5pc Maple / Wenge neck, a gorgeous bound Birdseye Maple fingerboard, some Made-in-Japan luminlay side dots, and even a set of powerful Bare Knuckle humbucker pickups. Add in the Lo-Pro Edge tremolo bridge, and some Prestige Fret Edge Treatment to the Stainless Steel Frets, and you have a high performance guitar that ideal for the modern musician. Renowned as the pick of choice for many of todays modern Metal guitarist, the hand-wound, high-profile Bare Knuckle Brute Force humbucker is the perfect choice for the RGR5220M-TFG. These high-output pickups produce a deep, saturated tone that's perfect for modern Metal. Not only that, but the RGR5220M also comes with a Coil Tap switch, allowing you to switch between Humbucker and Single Coil modes, opening up a whole new range of tones for you to experiment with. If you'd like to know more about the availability of this fantastic Ibanez RG guitar, contact our Online Sales Team directly or call into your local PMT Store and talk to one of our staff members - they're always eager to help. Alternatively, order yours today and once they're in stock you can use our fantastic Home Delivery or range of Store Pick Up options.